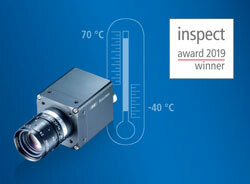 The Baumer CX.I cameras with their outstanding performance convinced the expert panel and participants of the online poll on the inspect award 2019 and were awarded 1st prize in the Vision category. The prize that is annually awarded by Wiley-VCH publishers recognizes special innovation in the area of industrial image processing. An expert panel selects the best 10 products each in the categories Vision, Automation and Control. From these, more than 45000 readers of the magazines inspect and messtec drives Automation as well as from other online portals were asked to select their favorite in an online voting process. The CX.I cameras gained headway with their overall concept that offers increased performance. For example, thanks to an expanded operating temperature range of -40 °C to 70 °C, no additional cooling or heating devices are necessary, which allows rapid and cost-effective system integration. 4 power outputs with pulse width modulation and an output power of up to 120 W (max. 48 V / 2.5 A) allow direct lighting control and make additional components unnecessary. With exposure times from 1 µs and frame rates of up to 1000 fps, the cameras can be deployed across industries flexibly and in demanding applications. The patented modular tube system allows lenses of different lengths to be protected against dust and dirt rapidly and flexibly using a variable number of extension rings. And when the demands are even greater, specially developed IP 65/67 and IP 69K housing accessories transform the CX.I cameras to IP 65/67 or IP 69K cameras in no time at all for use in hygienic areas of the food, beverage and pharmaceutical industries.